Poland's Prime Minister Beata Szydlo made no attempt to disguise her fury at the reappointment of fellow Pole Donald Tusk to steer EU policy for another 30 months. By refusing to endorse the EU summit's final statement, she told reporters, Poland would make it invalid. Poland's move is rare, but not unprecedented at EU summits. On occasion the UK, too, has taken a principled stand against the majority. No crucial EU decisions hang on Friday's conclusions, and this protest makes Poland look very isolated in the EU. Even Hungary - a close ally of Poland's nationalist government - decided to vote for Mr Tusk. The EU leaders can still put out a joint statement, though it will have less legal weight than the normal conclusions. Image caption Beata Szydlo said there was no place for a "multi-speed Europe"
The row has soured the atmosphere, just as the EU prepares to mark 60 years since its founding Treaty of Rome was signed. European unity is the theme of their talks on Friday - now overshadowed by the Polish flare-up. And with the Brexit process looming, the UK will be absent. 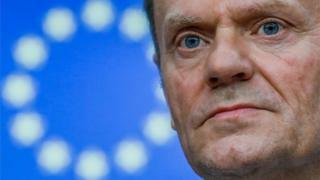 Marcin Antosiewicz, a reporter for Polish commercial WP TV, said the dispute over Mr Tusk "is about domestic policy - it's not about the EU". A recent CBOS opinion poll in Poland suggested that 52% of Poles rated Mr Tusk as a good EU leader, against 36% who were negative about him. The EU Commission suspects Poland's nationalist government of violating EU rule of law principles, over its changes to Poland's constitutional court and restrictions on the media. Ominously, Ms Szydlo also warned the EU that "there is no place for a multi-speed Europe" - contradicting what the leaders of France, Germany and Italy said in Versailles this week. She also criticised the EU for preventing a "blocking minority" when key decisions are taken - a rule change brought in to speed up EU business. "We can't accept this selective approach - we demand equal rights. Until this is understood as a principle the crisis will continue," she warned.